I use mind maps to help me remember and relate different ideas. This one is used to relate the communication plan or strategy our church needed to adopt in order to communicate within the congregation after we were forced into a mobile church scenario. I would like to describe how anyone can create this strategy with very little cost and time. The key to this communication plan is the WordPress website because of its ability to add plug-ins and adhere to internet standards and interfaces. We would register users and create and maintain newsletters. This newsletters would be actual posts to the website and their content would be distributed through email facilitated by these subscriptions. Email would be one channel that we would communication through. The subscribers would could get a newsletter with content or a link to that newsletter post in their email. These emails would be generated any time a post was published at the website. The second communication channel would be FaceBook. We had to create a FaceBook fan page to get this going which forced members of the congregation that used FaceBook to “Like” the page in order to see and updates. An update is generated to a fan page for each website post that is published and the FaceBook users would see a link to that posting at the website. Twitter is a third communication channel that was created for the Twitter users in our midst. Like the FaceBook channel they would receive updates from each website posting. All these users would need to do would be to “follow” a predefined user within Twitter. The remaining three items that are in the mind map deal primarily with integration with the website. Ministry leaders can communicate within the website in order to tell the congregation or members of that ministry anything new, updates, or events. Since these communications would be website posts the posts would generate information that would be sent out via the three channels we already talked about. External blogs can be maintained separately by church leaders and members. These external blogs would be integrated into the website using RSS into specific pages or posts that would be created or used to facilitate this integration. If these external blogs are WordPress blogs they can automatically generate posting to Twitter and FaceBook similar to the website. RSS can be used to flow the information needed to an RSS aggregator. These aggregators take the information that is on a website and displays it in one place, kind of like a news reader. So if a member of the congregation used an aggregator they could monitor and read any information posted on the website or external blog. 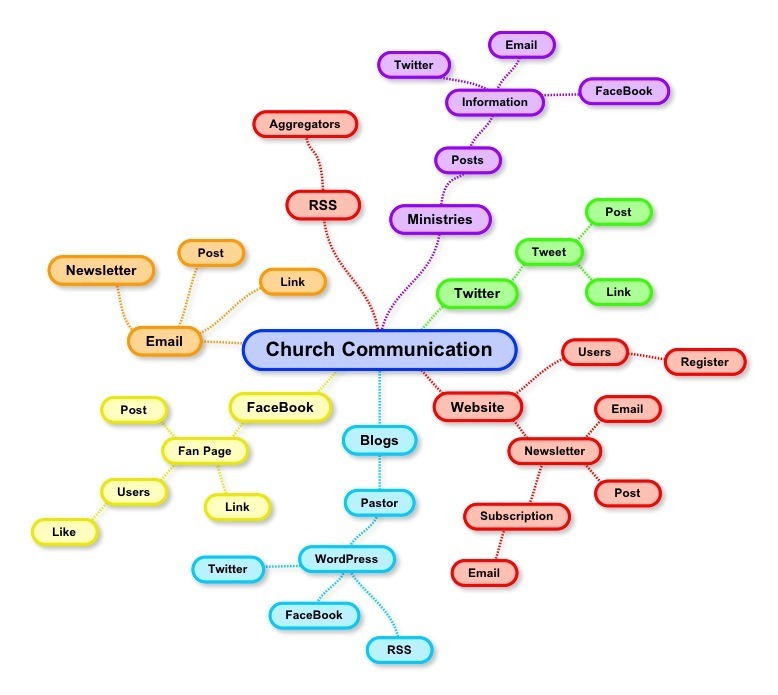 So I hate to tell you this but “anyone can create a communication plan for their church”. All you need is a bit of knowledge on how all of the different internet technologies and products work, can be integrated, and then generate content. Do you think you could do this for your church?